Welcome to the Lamb family of dealerships, where we thrive at creating lasting relationships with all of our customers. 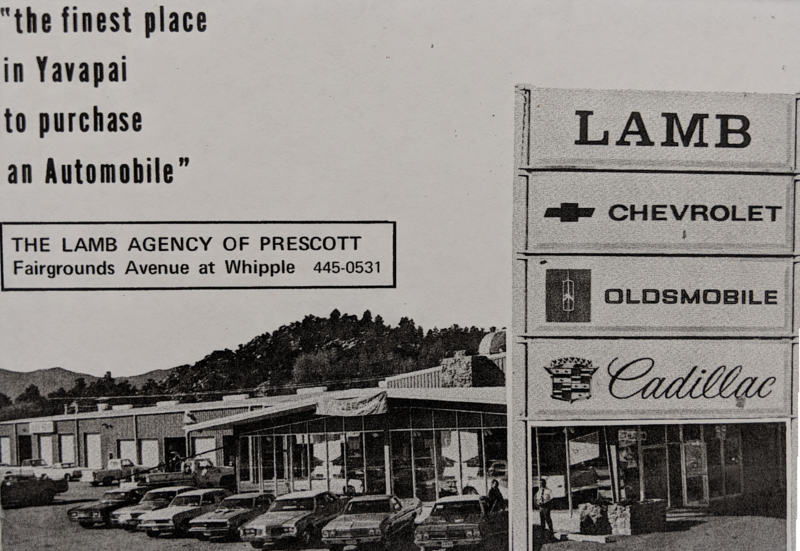 Lamb Chevrolet has served the Prescott AZ and surrounding areas since 1957. Ted Lamb acquired the dealership from a Lamb family partnership in 1967. Over the years, Lamb Chevrolet has grown into two separate dealerships housing Chevrolet and Nissan. Today, Lamb Chevrolet Cadillac and Lamb Nissan are conveniently located on the corner of Highway 69 and Prescott Lakes Parkway. Land marked by a 50 foot long American flag that waves 100 feet in the air, Lamb Auto Group covers over 10 acres of land. Our service departments are over 50,000 square feet with over 50 service bays complete with ASE and GM/Nissan Certified technicians to meet all of your automotive needs. Our expansive showrooms, with their high ceilings and tall waterfall with pass-through fireplace, gives our customers a relaxed and comfortable environment to explore their vehicle needs and desires. Thank you for choosing Lamb Auto for all of your transportation needs. We look forward to building a lasting relationship and we welcome you to the LAMB Family!